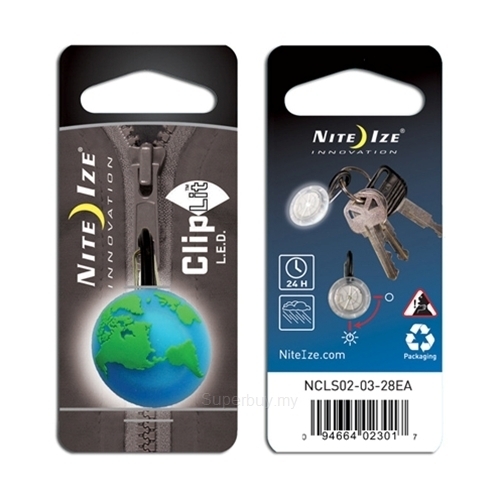 The Nite Ize ClipLit LED is a bright, water-resistant white light encased in a durable plastic housing and molded to a rugged plastic carabiner clip. Easy to activate - a quick twist turns it on and off - it&apos;s just as easy to clip onto and off of almost anything with a loop. Attach it to your key ring, belt loop, zipper pull, backpack or purse, and you&apos;ll have efficient, bright illumination wherever you are, whenever you want. The ClipLit is perfect for everything from reading fine print to finding a keyhole. And, when it&apos;s attached to your clothing, it&apos;s a fun and stylish way to let people know where YOU are when it&apos;s dark, increasing your visibility and safety. White LED, and eye-catching designs.